Un nouvel ouvrage sous la direction de Sébastien Barret (IRHT, section diplomatique), Dominique Stutzmann (IRHT, section de paléographie latine) et Georg Vogeler (University of Graz) vient de paraître aux éditons Brepols dans la collection Utrecht Studies in Medieval Literacy. The twenty essays brought together in this volume explore a wide range of perspectives relating to the materiality and textuality of medieval scripts and documents. The textuality and materiality of documents are an essential part of their communicative role. Medieval writing, as part of the interpersonal communication process, had to follow rules to ensure the legibility and understanding of a text and its connotations. 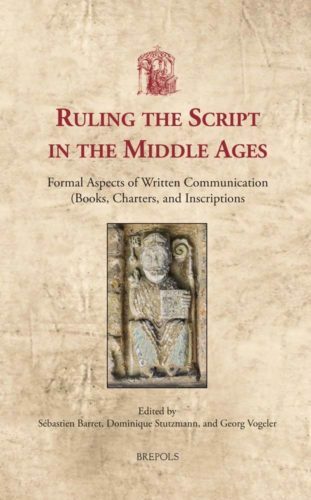 This volume provides new insights into how different kinds of rules were designed, established, and followed in the shaping of medieval documents, as a means of enabling complex and subtle communicational phenomena. Because they provide a perspective for approaching the material they are supposed to organize, these rules (or the postulation of their use) provide powerful analytical tools for structural studies into given corpora of documents. Originating in talks given at the International Medieval Congress in Leeds between 2010 and 2012, the twenty papers in this collection offer a precise, in-depth analysis of a variety of medieval scripts, including books, charters, accounts, and epigraphic documents. In doing so, they integrate current developments in palaeography, diplomatics, and codicology in their traditional methodological set, as well as aspects of the digital humanities, and they bridge the gap between the so-called ‘auxiliary sciences of history’ and the field of communication studies. They illustrate different possibilities for exploring how the formal aspects of scripts took their place in the construction of effective communication structures.